At Fab Food For You we can take care of pretty much everything needed for your special day. We offer a complete complimentary events planning service, meeting you in the weeks and months prior to your day to ensure everything runs just as you’ve always dreamed of. we are happy to take care of all the arrangements for your special day. If you’re really snowed under, Our complete hire service could be the answer to your prayers: marquee, furniture, kitchen equipment, glassware and stylish crockery (classic white or vintage to suit your event). We’ll take care of everything, leaving you to relax and enjoy the run-up to your event. Thinking about indulging your guests’ sweet tooth? We’ve got just the thing. 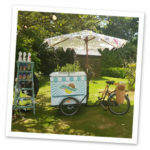 Betty is our fabulously retro ice cream trike available for hire. Ice creams are served with those delightful old-fashioned scoops that everyone loves. And as for the ice cream itself, you’re in for a real treat: we supply genuine, luxury Cornish dairy ice cream as the base for your delicious creations. But for us, it’s all about the toppings: you’ll get an array of sauces, flakes, sprinkles, chocolate buttons, chocolate orange segments, edible flowers and plenty more. Let us know your favourites and we’ll see what we can do! All set up but nothing to drink? Let our mobile bar hire service in East Sussex take care of everyone’s thirst from kick-off to wind-down. We will happily create themed drinks and quirky bar decor to slot neatly into your event’s overall style, so give us a call on 07890 183293 to get inspired. Our event bars for hire come loaded with all your favourite branded drinks, plus we’ll see you right with mixers, ice, soft drinks, straws, napkins and ice. Alternatively, if you fancy shaking up the cocktails yourself, our dry bar hire has got you covered for mixology fun. We’ll supply all the behind-the-bar fixings; you bring your refreshments of choice. For ease and safety, we stock our bar with disposable glasses as standard. However, if your event requires glasses for a more refined touch, just let us know and we’ll arrange glass hire. We’ll take care of all the washing up and polishing, so you don’t have to worry about a thing. We’ve made sure that we hold all the necessary licences and insurance policies to be able to serve you and your guests legally and safely. So when you hire a Fab Food For You mobile bar, you know you’re covered in every respect. 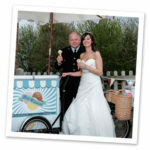 We’ve invested in two Fab Food For You hire bars so chances are, one of them will be free when you need them. Make sure you contact us in plenty of time to secure your spot! Whether you fancy a dry bar hire or need us to come packing with everyone’s favourite tipples, you’re in control.